The Tariqa Burhāniyya (Arabic: الطريقة البرهانية الدسوقية الشاذلية‎‎ Ṭarīqa al-burhāniyya al-disūqiyya al-šāḏuliyya; also written al-Burhāniyya or Burhāniyyah) is an Sufi order founded by Sayyidi Abul Hasan ash-Shadhuli and Sayyidi Ibrahim al Disuqi in the 13th century. The order's full name is Tariqa Burhaniya Disuqiya Shadhuliya, referring to its founders. 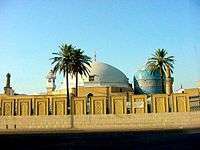 Burhan-u-din is a surname of Sayyidi Ibrahim al Disuqi and means "evidence of religion". The order has a registered charity in the UK, Tariqa Burhaniya D'suqiyya Shazuliyya (tbds); Registered Charity Number: 1041647. The order was renewed by the Sudanese Sheikh Mawlana Mohamed Osman Abdu al Burhani (1902–1983). After his death the leadership of the order passed to his son Sheikh Ibrahim as Sheikh Mohamed Osman Abdu al-Burhani. During the leadership of Sheikh Ibrahim the order was spreading also in other parts of the Arab Middle East, especially in Europe and North America ( United States, Canada ). Since 2003 the order is under the guidance of his grandson Sheikh Mohamed as Sheikh Ibrahim as Sheikh Mohamed Osman Abdu al-Burhani. The domicile of the european center of the order is located on the edge of the Lüneburg Heath in Germany. ↑ http://www.charitiesdirect.com/charities/tariqa-burhaniya-dsuqiyya-shazuliyya-tbds-1041647.html, Charities Direct, Tariqa Burhaniya D'suqiyya Shazuliyya (tbds), Retrieved February 12, 2011.